Serums have become quite popular in the beauty world lately, and now that my skin is calm again, I’ve been trying samples of different serum types. Since my skin is oily, I was nervous to use anything with a lot of oil, but I’ve found that just a drop or two in the evening adds enough moisture without overpowering my skin. You can technically use a serum in the morning and evening, but I’ve found that nighttime use alone works best for me. I recently learned about Seed to Serum, a lovely online site for natural beauty, and was thrilled to discover that they offer deluxe trial sizes of most of their products. This is a great way to try out a serum or other item before committing to the full-size bottle, and I ordered sample sizes of R.L. Linden & Co.’s Fairer Than Lilies Serum Cleanser, made especially for Seed to Serum, as well as their Time After Time Serum, which I really love. The cleanser is oil-based, so I use it as a second step after washing my face, usually when I need a little extra moisture. And the Time After Time Serum is light and really lovely, so I usually skip my evening moisturizer when I use this. 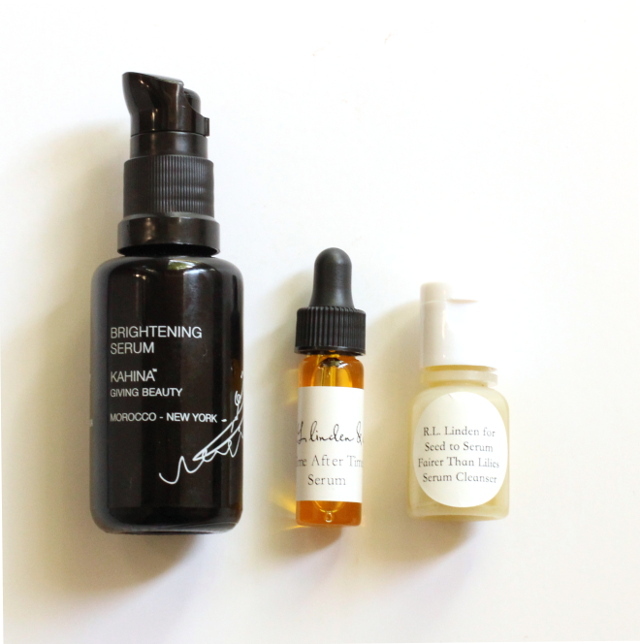 I’m also several weeks into my bottle of Kahina Giving Beauty’s Brightening Serum, and it smells gorgeous and sinks gently into my skin. Kahina Giving Beauty uses argan oil in their products and also employs a cooperative of women who produce the oil, so it’s a brand I’m happy to support. The Brightening Serum promises noticeable results after six weeks, and I’m enjoying it very much. I personally don’t consider facial serums a necessary part of my skincare regimen, but I’m happy with the types I’m currently using. Do you use a facial serum? I’d love to hear which brands you like, so feel free to let me know!